STiki is an anti-vandalism tool for Wikipedia. Unlike similar tools, STiki does not rely on natural language processing (NLP) over the article or diff text to locate vandalism. 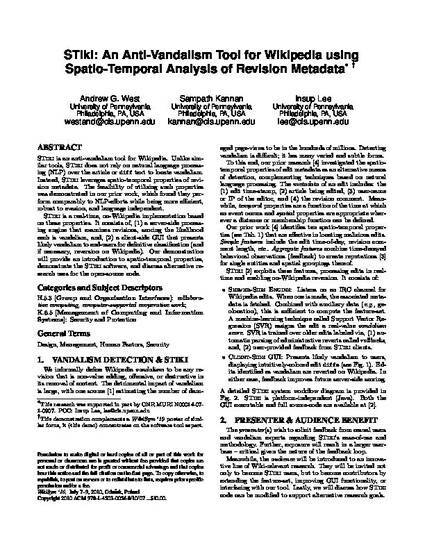 Instead, STiki leverages spatio-temporal properties of revision metadata. The feasibility of utilizing such properties was demonstrated in our prior work, which found they perform comparably to NLP-efforts while being more efficient, robust to evasion, and language independent. STiki is a real-time, on-Wikipedia implementation based on these properties. It consists of, (1) a server-side processing engine that examines revisions, scoring the likelihood each is vandalism, and, (2) a client-side GUI that presents likely vandalism to end-users for definitive classiffcation (and if necessary, reversion on Wikipedia). Our demonstration will provide an introduction to spatio-temporal properties, demonstrate the STiki software, and discuss alternative research uses for the open-source code. © ACM 2010. This is the author's version of the work. It is posted here for your personal use. Not for redistribution. The definitive Version of Record was published in Proceedings of the 6th International Symposium on Wikis and Open Collaboration (WikiSym '10), http://dx.doi.org/10.1145/1832772.1832814.